Few things are more infuriating than discovering you were overcharged by an unreliable contractor when it’s too late to do anything about it. You’ve been duped into paying high installment prices for an expensive new system that is not the best option for your home. To help you avoid this frustration, the team at OnTime Service is here to share 6 questions to ask during your AC estimate. 1. What size or capacity system does my house need? Firstly, you should make sure you are given accurate estimates of what size your AC unit should be. If you install a system that is too small, it will not adequately cool your entire home. Conversely, a system that is too large for your home can use too much energy and fail to deliver a comfortable temperature. As a follow-up question, ask: “How do you determine the right size of AC unit I need?” Take some time beforehand to learn about the calculation process professionals should use, called the Manual J Load Calculation. This will help you discern the reliable contractors from the inexperienced ones. 2. Can the existing duct work be used? 3. Are there new technologies I should consider? 4. What’s the most energy-efficient system for my house? 5. Could you please provide proof that your company is licensed, bonded, and insured? If the contractor has correctly answered your questions so far, you should ask for proof that they are licensed, bonded, and insured. Any hesitance to provide proof of any of these three qualifications should be a red flag. 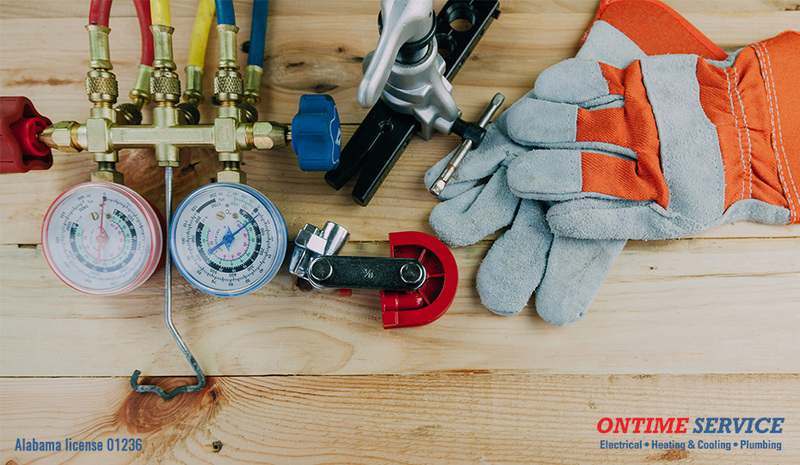 A license indicates that a contractor is trained and experienced in handling and installing the HVAC equipment for the job. As an equally important credential, proof of being bonded and insured means a contractor is able to assume financial responsibility through a third-party bonding and insurance company. This is essential in case of any on-site accidents, property damage, or failure to complete the job. 6. What’s the time-table for installation? Put Your Worries to Rest with OnTime Service! Now that you know 6 questions to ask during your AC estimate, you can make an informed decision when you select your new AC unit. However, selecting the right HVAC technician is just as important. If you are looking for the best technician for the job, look no further than OnTime Service! Our experts are ready to help you find the ideal HVAC system for your home. Call us today at 251-272-3595 or fill out a service request form on our website.